Discover the magic of the emerald city on this 4-hour tour of Seattle. Experience the vibrant noises of Seattle, explore neighborhoods such as Chinatown and catch the perfect view from Queen Anne's Hill. This public tour provides an excellent overview of central Seattle from a comfortable mini-couch and stops three times throughout the tour. Seattle, the crown jewel of the Pacific Northwest, is a vibrant city of dramatic contrast and diverse people - a towering Mt. Rainier and the glistening waters of the puget sound stand in sharp relief to the working class neighborhoods, booming tech businesses and gourmet restaurants that fill the town. Exploring Seattle can be an adventure unto itself, which is why pairing with an expert, knowledgeable guide can be such a good idea. 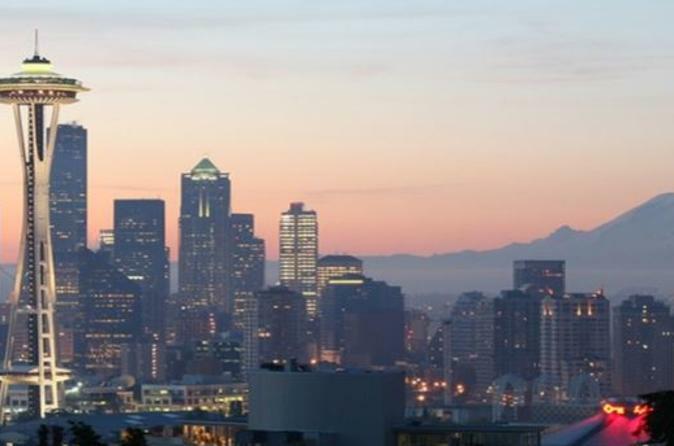 Rather than spending days wandering through neighborhoods trying to understand how the myriad of seemingly disparate parts all fit together, this tour will show you the sites and give you the overview necessary to understand the real Seattle. The tour starts with a pick-up at your centrally located Seattle hotel. The vehicle the tour is conducted in is dependent on the size of the group. Vehicle size ranges from 10-24 passengers, but never more to ensure personal attention. After taking in the sights of this amazing food wonderland, you will begin an exploration through Seattle's best known attractions, icons, and neighborhoods. You will see the Space Needle, China Town, Safeco Field, the waterfront, Puget Sound, Kerry Park scenic overlook, Pioneer Square and Ballard Locks. Along the way, your charming, expert guide will share personal stories, strange anecdotes, and pertinent history to help you understand the City in a whole new light.